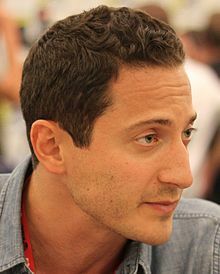 Sasha Roiz (born October 21, 1973) is an Israeli-born Canadian-American actor. He is best known for his portrayals of Sam Adama in the science fiction television series Caprica and Captain Sean Renard in the American dark fantasy television series Grimm. Roiz was born in Tel Aviv to Russian Jewish parents. The family moved to Montreal in 1980. Roiz studied history before joining a theatre school in Montreal. He later graduated from the Guildford School of Acting in Guildford, Surrey. Roiz has appeared in a number of popular television dramas, including CSI: Miami, House, NCIS, The Mentalist, Lie To Me and Terminator: The Sarah Connor Chronicles. He had a recurring role on Warehouse 13 as Marcus Diamond. In 2008, Roiz landed the role of Sam Adama on Caprica, a spin-off of Battlestar Galactica. His character is a Tauron enforcer for the Ha'la'tha crime syndicate on Caprica who frequently goes head-to-head with his lawyer brother Joseph Adama (played by Esai Morales), and is also the uncle of William Adama. On April 28, 2009, his role was expanded to series regular. Roiz stated in an interview that it was later revealed to him that his character would be gay, something he felt was an opportunity to explore the dynamic relationship of a gay character in a science fiction setting, as well as to explore the issue of homosexuality on a social level. In 2012, he guest-starred in the second season of the Jane Espenson scripted romantic comedy web series Husbands. 2001 Largo Winch Sergei Episode: "Endgame"
2003 Mutant X Nathaniel Episode: "Wasteland"
2004 Missing Randall Markham Episode: "In the Midnight Hour"
2004 Kevin Hill Nick Bratt Episode: "Gods and Monsters"
"In the End You Get What You Deserve"
2007 NCIS NCIS Agent Rick Hall Episode: "Grace Period"
2007 CSI: Miami Darren Butler Episode: "Guerillas in the Mist"
2008 Terminator: The Sarah Connor Chronicles Police Officer Episode: "Gnothi Seauton"
2009 Lie To Me Captain David Markov Episode: "A Perfect Score"
2009 The Mentalist Keith Wolcutt Episode: "Crimson Casanova"
2010 In Plain Sight Anton Ivanov Episode: "Love's Faber Lost"
2010 CSI: Crime Scene Investigation Danny Macklin Episode: "Pool Shark"
2011 House Driscoll Episode: "Carrot or Stick"
2011 Castle Bobby Stark Episode: "Pretty Dead"
"The High School Reunion Part 2: The Gang's Revenge"
2012 Husbands Photog Episode: "Appropriate Is Not the Word"
2018 Taken Maximilian Silver Episode: "All About Eve"
2019 Lucifer U.S. Marshal Luke Reynolds Episode: "Everything’s Okay"
^ Dittman, Earl (January 30, 2015). "For Sasha Roiz, life in Portland is anything but 'Grimm' (Includes interview and first-hand account)". Digital Journal. Retrieved 2017-04-03. ^ Kates, Kathryn. "Jaffa-born actor stars in CityTV mini-series". The Canadian Jewish News. Archived from the original on May 8, 2009. Retrieved 2011-11-24. ^ Hinman, Michael (July 26, 2011). "Sasha Roiz Keeping Busy With 'Warehouse 13,' 'Grimm'". airlockalpha.com. ^ Spelling, Ian (2009-03-19). "Caprica star Esai Morales sees parallels with these great stories". Sci Fi Wire. ^ Phillips, Jevon (January 16, 2010). "'Caprica' countdown: Sasha Roiz says, 'Something ominous is coming'". Los Angeles Times. ^ Jensen, Michael (February 3, 2010). "Move Over, Captain Jack. There's a New Gay in the Galaxy Named Sam Adama". AfterElton.com. ^ Vary, Adam B (28 June 2012). "'Husbands': EP and star on season 2 of their gay-marriage web series -- EXCLUSIVE PHOTOS". Entertainment Weekly. Retrieved 28 June 2012. ^ "Sasha Roiz on It's Always Sunny in Philadelphia, new interview..." Capricatv.net. This page was last edited on 21 March 2019, at 17:21 (UTC).